Through dusty prairies and Northern landscapes of mostly brown and grey, intermittent hills carved millenia ago, passed few, small, scattered lakes and towns, nuclear reactors and the characteristic cirty-outskirt industries of China, the bus from central Beijing has been rumbling along for over two hours; you are about to arrive in the somewhat, if not perhaps artificially, sealed-in-time village of Cuandixia, 爨底下. The winter has passed and the hills surrounding you are beginning to transform themselves with the sprouts and buds of spring. Cherry blossoms lightheartedly pop up and speckle the terraced hill sides in bright pink contrast to the winter’s earth tones, sun dappled clumps of petal or reflective mineral seize cloud breaks to demonstrate their luster amid golden husks of last year’s corn, clumps of increasingly verdant juniper and still brownish skeletons of deciduous residents in tantalizing Bob Ross displays. Coming from the sand, glass and steel, population, frenetic pace and demands of Beijing, the mountain air, the infectious, almost soporific, relaxing temperature and tempo of Cuandixia is ideal for short term sojourns from the city. Indeed, Cuandixia has been serving similar purposes, as a road side inn, a stopping point to warm and feed along the Silk Road, a burning fire kept warm to protect and nourish travelers and residents, since it was established during the Ming Dynasty (1368-1644). Moving Westward from Shanxi, the Han clan eventually settled in the depression of two hills some 80 kilometers from modern day Beijing. The spot they chose, tucked into a valley between what looks like giant Pandoro cakes, the favorite pointed cakes of Italian children on Christmas, would be named Cuan, a complicated character with several founding legends and etymological connotations, dixia: the land below, or beyond, the furnace. According to the most prominent story, the monk Han Shoude, a villager who is said to have strongly resembled the reigning Kangxi Emperor (1661-1722) of the Qing dynasty, worked in service of the emperor and, with imperial funds, constructed much of the grander buildings, courtyards, and landscaping that formed Cuandixia into its recognizable manifestation of tiled roofs, narrow passages that now jut up to beehives, courtyards and scenery. The name, Cuan (header photograph), means stove. For the villagers of Cuandixia, it carries the signification of not only warmth, and a source of food, but of shelter and protection. 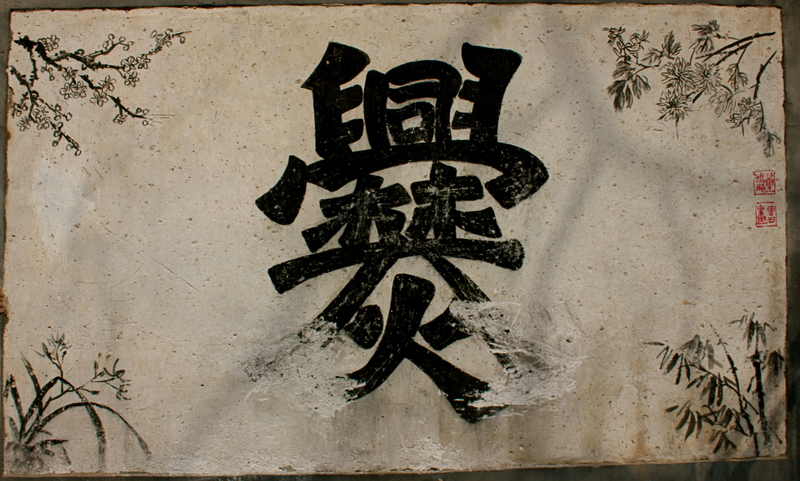 The meaning and legends have perhaps blurred a little over time but residents and neighbors will still speak of the significance of the name, in the idiosyncratic way some Chinese people discuss the etymology of a unique character. Chinese history is rich with internal conflicts. The saga of the Three Kingdom’s period, a protracted civil war during the 3rd century AD is one of the most popular and known periods of Chinese history. And many centuries later, in the Ming dynasty, for the Han clan the myriad sagas of conflict, poverty, and prosperity were no doubt fresh in their mind as they made the migration from their native Shanxi, several hundred kilometers to the West, in search of security in the hills. With these stories comes the multiple meanings of the stove: to keep warm the home fires, as a shield against hunger, cold, and the scourge of war. Of course, all that remains of this time is what is still stained on the walls. In the last several years Cuandixia has grown from a secret tourist gem to a well known but still seldom visited destination. The issue of internal migration, rural residents moving to cities in search of better paying work-only to sometimes find exploitation or the later loss of rural rights-is a national issue surely, and Cuandixia has recently faced the same problems as other villages in China. It is inhabited primarily by the elderly and some young. Those of working age have left to take jobs in factories or salons in Beijing, Hebei, or Guangdong. Some return, others never do. One will see construction, repaving a road or building a new stone house, but many of the workers will themselves be migrant laborers from other parts of China, such is the contemporary ballet of labor migration across the country. The parents and grandparents of Cuandixia remain to manage guest houses. The village is a truly Northern Chinese caravansary, for every old courtyard house has been converted into an inn, 客栈. Some are more renovated than others. Choices range from ground level to slightly higher on the hill. Each guest house has a kitchen and modest menu and every resident of Cuandixia seems to keep bees. In fact, in much the way that every locale through China has its techan, 特产, (special local product), Cuandixia is best known for its honey production. But the increase in tourism has apparently placed too high a strain on the locals. Of the five or six jars I looked at, none boasted the thick, speckled, opaque, fresh, handmade honey I had heard about. However, it is still much cheaper than honey you will find in the city. The honey can be seen as a kind of sweet contrast to the bitter reminders of lingering propaganda on the walls. Past the writing on the walls, the signs for honey and guesthouses, the unique architecture of courtyards, stone windows, and alleyways spotlight the rising hills and terraced fields in the distance. Cuandixia has also long been a popular retreat for painters, poets, and more recently day hikers. Some local hiking groups have visited the location for its gentle trails and views. You can hike between several villages in the area and, unlike other regions in Northern Beijing that are less accessible by public transportation, Cuandixia is relatively easy to reach. At only a few hours from Beijing, this nestled escape is worth the journey. Cuandixia is located in the Mentougou, 门头沟, district of Beijing. Beijing is broken into a total of 16 districts. Mentougou is in the far West, between Changping District to the North, Haidian, Shijingshan, and Fengtai to the East, Fangshan to the South, and Hebei Province to the West. Mentougou District has a population of about 300,000 which translates into the lowest population density of Beijing’s various districts. According to geological data Mentougou is roughly 90 per cent mountains, which contributes to its low population density and its rolling landscape popular with day hikers. Cuandixia is easily reachable from the Pinguoyuan, 苹果园, subway stop on the Western terminus of Line one. From the metro station take bus 929 or bus 892. There are multiple 929 buses but they do not follow the same route. The 929 direct to Cuandixia only departs two times a day: once at 7:40 am and again at 12:40 pm. There is information online that sites other buses but conversation at the transit station contradicted this information. If you miss 929 at either of these times the 892 bus to Zhaitang, 斋堂, is the other best option. This bus is frequent, beginning at 7am it runs until 5:10pm. The cost for either bus, 929 or 892, is 16 RMB. From Pingguoyuan to Cuandixia via a black cab will start bidding at 200 RMB. If you take the 892 to Zhaitang, when you arrive in Zhaitang there will be several hired cab drivers waiting to take you the rest of the way. You can negotiate a price with the drivers at Zhaitang. Don’t pay more than 20 RMB. If you wish to arrange for transportation in advance, Zhaitang resident Mr. Li Wei, 李伟, is very friendly and can be reached at 13146517262. He can also assist with transportation to some of the other villages in the area. An entrance ticket to Cuandixia will cost 35 RMB and can be purchased at the gate just outside the village. The bus or hired cab will stop for you to purchase your ticket. However, a number of the hired cab drivers will likely make you the offer to give them the cost of the entrance ticket and take the ride for free. For example, if there are three of you in the cab, the driver will suggest that you give him the 105 RMB, paying nothing for the ride, and he will drive you in without buying a paper ticket. He keeps a cut and gives a cut to his friends at the gate. You can probably barter for a cheaper rate if you wish. Once inside you will not have to show a ticket. Once you arrive in Cuandixia there is no shortage of guest houses, unless you go during a national holiday. Don’t go during a national holiday. 财主院客栈 and 古城客栈 are good options for guest houses but there are many others. Don’t pay more than around 50 RMB per night, depending on the season bartering is possible. All the guest houses will also have kitchens for meals. Make sure to check prices before ordering as people have reported being scammed into exorbitant prices. The following is an example of some food and prices to expect: 肉炒菜椒 25元, 疙瘩汤 10元, 香椿摊鸡蛋 20元, 葱花饼 6元, 拍黄瓜 12元; a 1.5 liter bottle of water will cost around 3RMB or 5RMB for two bottles. A jar of honey will sell for between 25 and 50 RMB. FOR MORE IMAGES FROM CUANDIXIA CLICK HERE. 爨 is one awesome character.